This wavelength selective scattering film is an affordable transparent display that can be used for marketing in the form of advertisements on retail store fronts, transportation, underutilized glass, and buildings. The transparent display is dynamic, updates in real-time, and has the option to turn on and off. Our transparent display can replace costly and bulky signage and provide the experiential marketing that retailers seek. Unlike other transparent displays, our wavelength-selective material projects images and video from both sides of the film and at all viewing angles. 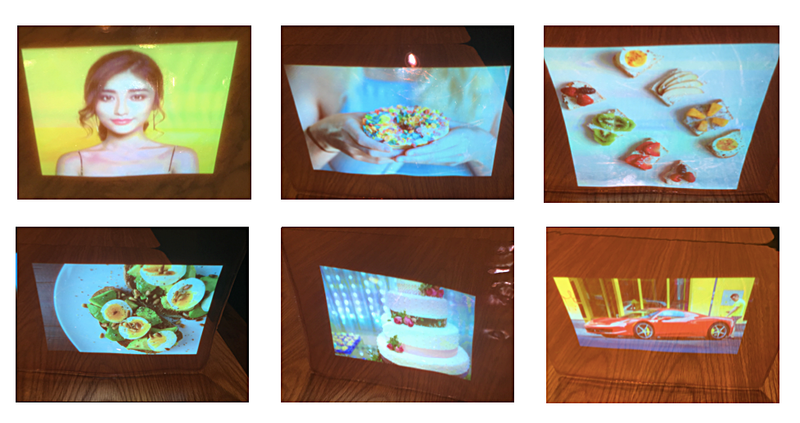 The transparent display on the left was made at MIT at the conception of the invention in 2014. Lux Labs incorporated the technology into its portfolio in early 2018, and after further research and development, fabricated the improved display on the right.